Over the last weekend my wife and I had a short four day holiday on Yorke Peninsula. We stayed in a holiday unit at Edithburgh, about a four hour drive from our home. Edithburgh is a small town near the bottom of the peninsula, directly opposite Adelaide which is on the other side of Gulf St Vincent. It has been far too many years since our last visit. The peninsula offers some interesting birding with mixed farming covering most of the region, mainly wheat and sheep. There are also remnant mallee scrub areas, particularly in the south and of course the long coast line offers good birding opportunities where there is access to the beaches. One major goal was to spend time in Innes National Park on the southern tip of the peninsula. On this visit I didn’t anticipate making a long list of birds seen. Many of the migratory seabirds have long since flown to warmer parts in the northern hemisphere. In another blow, the weather forecast was far from promising good birding; gale force winds and rain. Still, we had a booking in one of the many holiday units and we were looking for a relaxing break regardless of what was thrown at us. I didn’t see any of my target birds: Mallefowl, Western Whipbird and Hooded Plover, but I still managed some great birds, including Crested Bellbird, Blue Bonnet parrot, Rock Parrot and great views of Ospreys. Over the coming days I will share some of my sightings, along with the usual photographs. On a recent visit to Victor Harbor on the south coast of South Australia we were staying with friends for a few days. We’d been for several drives and in the evening we went for a walk along the Hindmarsh River to beach. It’s a quiet walk along this small river but there weren’t too many birds showing themselves as we went along. On the beach however, right next to the mouth of the river, a solitary Hooded Plover was scuttling along the edges of the river and on the beach. I managed several reasonable photos before it flew off. This species is widespread along the southern coast of Australia but is not common anywhere. In fact, it is on the endangered list because there are so few of them. This beach – one of the busiest in South Australia – is one of its strongholds and is known to nest in the dunes along the sea front. It’s great seeing – and being able to photograph – such a rare species. 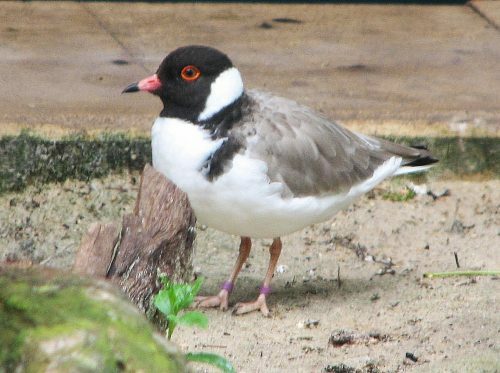 The Hooded Plover is found along the southern coast of Australia, from Tasmania, though Victoria, South Australia and southern Western Australia. Its preferred habitat is sandy beaches where there is plenty of seaweed and there are nearby rocky outcrops, reefs and sand dunes. In some parts it can be found at salt lakes some distance inland in SA and WA. It lays its 2 or 3 eggs in a shallow scrape in the beach sand during the months of September to January. The Hooded Plover is an endangered species. On the Fleurieu Peninsula near where I live there are fewer than 75 left, according the warning sign near the beach at Victor Harbor (see below). On a visit to Victor Harbor some years ago I was walking along this beach watching over about 60 primary school children on an end of year school camp. Trying to keep so many little feet away from the nest with two eggs took a major effort, but the birds patrolling the beach nearby were not too disturbed. Why they chose one of the busiest beaches in South Australia to lay their eggs is a mystery to me! I hope they survived. The bird in the photo above was not taken at the beach. It was of a bird in an aviary at Adelaide Zoo where the keepers have cleverly recreated a small sandy beach to imitate its natural habitat. If you see plenty of this kind of bird, or you want to learn more about waders and shorebirds, go to WorldWaders Posterous. This blog features wading birds from all over the world. Plenty of good photos are posted there too. You are currently browsing the archives for the Plovers Dotterels and Lapwings category.